On January 1, 2008, if someone had told me that over the next 364 days I would travel on more than 100 airplanes, I would never have believed them! These travels began in early January with my trip to the APS Ameristamp Show in Charlotte, N.C., and ended with a New Year’s Eve fl ight back to Michigan to be with family. In between, I attended over a dozen stamp shows, numerous auctions and visited with many stamp collector friends and clients all over the country. Since graduating from college last May, rarely has there been a week where I have not been on two fl ights. In the interest of full disclosure, having a long distance girlfriend defi nitely added to my travel itinerary...in a good way, of course! Another bonus on the amount of traveling was that the many plane rides gave me opportunities to catch up on some much needed sleep. On a trip last November, I took along one of my favorite stamp related books—Nassau Street by Herman Herst Jr. I fi rst read this book when I was in fi fth or sixth grade, right around the time of Herst’s death. I remember bringing the book to school and reading it during homeroom and in study hall. I have probably read it cover to cover ten times since. I have always enjoyed the many anecdotes and stories found in its pages. Who knows if they are all true; it doesn’t really matter. I, along with tens of thousands of other stamp collectors, have enjoyed imagining the world immersed in stamps described in the pages of Nassau Street. Upon my recent re-reading of Nassau Street in National Airport near Washington D.C. (I lovingly refer to National Airport as my home away from home), I came across a section that I had never given much thought to until then. The stories that I am about to refer to take place in Chapter 18 right after Herst tells the reader about the Visiting Firemen of Philately. The story goes that, after giving an address to a New England stamp club, the club’s treasurer offered Herst a check to cover his travel expenses. Since the club was only a few hours from Herst’s home and had “prepared a particularly nice dinner,” Herst declined the offer. This humorous story is followed shortly by a story of an invitation Herst received to speak to a group of students. Herst planned for a presentation to high school students but realized once he arrived at the school that he would be addressing second graders. Herst quickly switched course on the material and direction of his intended presentation to one that would be more suitable to his audience. I decided that the only trips that I would love to add to my already busy 2009 travel schedule would be ones that got me into classrooms to talk to students of all ages about stamp collecting. With the right angle and materials, a presentation about the history, geography and fun found throughout stamp collecting can reach any non-stamp collecting audience from age seven to 77. I have very much enjoyed talking about stamps and postal history with elementary school students, college students and older adults over the past several years. I now want to expand these efforts. P.S. It would be even more fun to engage a classroom or lecture hall full of students with different aspects of stamp collecting and then afterwards to make a presentation to a local stamp club. I cannot promise to be as entertaining as Mr. Herst (though I will try) while updating local stamp club members on the efforts nationwide to encourage more young people to collect stamps. I promise that I will not be seeking a reimbursement for travel expenses or even a good meal. 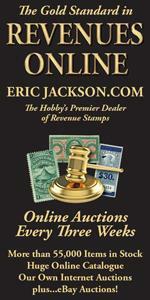 As I have said on many occasions, we all have a vested interested in seeing the hobby of stamp collecting grow. Please be proactive and contact me to discuss the possibilities of bringing stamps into a classroom/lecture hall near you!